We recently reported on the first two matches of South Africa’s developmental squad played against the QANTAS Kickstart Indigenous Youth Team in Jabiru and Darwin. Here we present a more in-depth look at those games, including photos, and a wrap up of the third and final match. The first game of the South African’s tour of Australia was played at Jabiru, a mining town in the middle of Kakadu National Park. It could hardly be further from the first games played between the Indigenous Australians and South Africans in early 2006 in South Africa. The South African team is vastly different from the open age sides which competed in the 2005 International Cup in Melbourne and against the Indigenous Youth Team which toured South Africa in February and March 2006. Only four players toured Australia in 2005 and only six played against the Australians in 2006. This high turnover of players can be attributed to many factors, including a focus on youth development and players finding work and attending university in provinces where Australian Football is not yet established. The South African team touring Australia is a much younger team and includes four players from the Western Cape. The Western Cape has a strong rugby culture, the players have all grown up with the oval ball and have good ball skills. The Western Cape is also one of the newest areas for Australian Football development. The third game of the 2006 Indigenous tour was played in Stellenbosch which is approximately 30 minutes from Cape Town. This game and the fact that four players have made the South African team can only be good for the development of the game in South Africa. 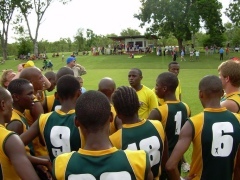 In Jabiru last week the South African team put in a very good performance after the Indigenous Australian boys threatened to blow the game apart with very early goals in the first quarter. After the initial onslaught the South Africans got going and started to become competitive. Their attack on the footy and the player with the ball was impressive. Unfortunately some skill and decision making errors allowed the Australian team to push forward and set up goal scoring opportunities. The game was of a high standard despite the slippery conditions, both teams impressed and the second game promised to be an exciting affair. The better players for the South African team were Kabelo Boikanyo with two goals, JB Van Zyl, Steven ‘Maplunka’ Matshane, Sinethemba Boki and Kagiso Gaonose. The second game of the South African tour was played at TIO Stadium in Darwin as the curtain raiser for the Indigenous All Stars v Essendon game. The Indigenous Australian team were an improved outfit and although young they looked very accomplished. Both teams performed very well in front of an ever growing crowd. The South African side looked dangerous going forward although they just couldn’t put the score on the board. As with the first game the South Africans applied very good physical pressure on the player with the ball and their attack on the ball was great. But, again as with the first game some skill and decision making errors let them down. Many of the South African players have not played much competitive football. Match practice will help them improve these skills and make them a better team. It’s vital for the South African team to get as much match practice and international exposure as possible. The next couple of months will be great for footy in South Africa as an Australian tourist team, The Convicts, are soon to tour South Africa and an elite Australian Institute of Sport (AIS) Youth team will be touring soon after that as well. The second quarter saw the South African team score three goals and outscore the Australians. An opportunistic goal right on the half time siren capped off a great quarter and saw the South Africans go into the long break only two goals down. Both teams were playing good footy and the ever increasing crowd were enjoying the match. The second half of the game saw the Australians show their quality - only inaccurate kicking stopped the margin from blowing out. A late third quarter goal to South Africa gave them a glimmer of hope heading into the last quarter. The pace of the game slowed in the last term due largely to the oppressive conditions and both teams’ hectic schedule. In the end the Australian team ran out 43 point winners and won the series 2 – 0. However, the result is not as important as the development of the players and the game in South Africa, both of which have taken large steps forward with this tour. The better players for South Africa were Julian Horn, Steven ‘Maplunka’ Matshane, Samuel ‘The Mask’ Sethibe and Sandile Xhasa. The visitors impressed and improved in the two games played and no doubt gained some valuable insights from assistant coach Peter Schwab. Having such football knowledge involved with the team can only be good for the development of the players and the game in South Africa. In the final match of their Australian odyssey, Tuesday 13th February saw the young Buffaloes took on an indigenous youth side from the Clontarf Academy. In yet another encouraging display the Africans were extremely competitive and at various stages looked like they might win the match. Without knowing both sides in detail it is always difficult to know whether they put their absolute best teams on the field, but clearly this young South African team has promise and some of their best should enhance the senior side in 2008. The match was held at the superb Subiaco Oval with excellent facilities and a significant media presence, though a very small public turnout as expected. After the match there was a dinner for the media at which the AFL announced an even stronger push into South Africa. In the next few days we'll report on some of these very exciting further developments for footy in South Africa, some early news on plans for the 2008 International Cup and the AFL's feelings on the future of International Rules.